Australian hip hop inhabits an uncomfortable space - creatively, culturally, commercially. Stuck somewhere between accent, place and representative purpose, Australian crews have often found themselves either inhibited by ockerism, or struggling for identity under the influence of their American counterparts. Melbourne band, CURSE OV DIALECT break out of this mould. We're driving through Melbourne's inner west, on our way to Adam's place. The traffic's bad and the day's overcast. Adam's talking about the band's cross-cultural reputation - one that sees them constantly misunderstood by both the hip hop and indie communities. 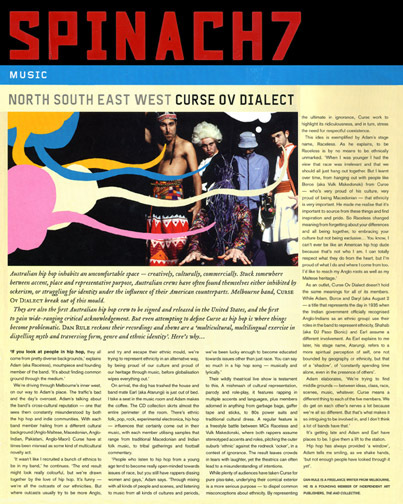 With each band member hailing from a different cultural background (Anglo-Maltese, Macedonian, Anglo-Indian, Pakistani, Anglo-Maori) Curse have at times been misread as some kind of multicultural novelty act. On arrival, the dog has trashed the house and band mate Earl (aka Atarungi) is just out of bed. I take a seat in the music room and Adam makes the coffee. The CD collection skirts almost the entire perimeter of the room. There's ethnic folk, pop, rock, experimental electronica, hip hop - influences that certainly come out in their music, with each member utilizing samples that range from traditional Macedonian and Indian folk music, to tribal gatherings and football commentary. Their wildly theatrical live show is testament to this. A mishmash of cultural representation, parody and role-play, it features rapping in multiple accents and languages, plus members adorned in anything from garbage bags, gaffer tape and sticks, to 80s power suits and traditional cultural dress. A regular feature is a freestyle battle between MCs Raceless and Vulk Makedonski, where both rappers assume stereotyped accents and roles, pitching the outer suburb 'ethnic' against the redneck 'ocker', in a contest of ignorance. The result leaves the crowds in tears with laughter, yet the theatrics can often lead to misunderstanding of intentions. While plenty of audiences have taken Curse for pure piss-take, underlying their comical exterior is a more serious purpose - to dispel common misconceptions about ethnicity. By representing the ultimate in ignorance, Curse work to highlight its ridiculousness, and in turn, stress the need for respectful coexistence. As and outlet, Curse Ov Dialect doesn't hold the same meanings for all it's members. While Adam, Borce and Daryl (aka August 2 - a title that represents the day in 1935 when the Indian government officially recognized Anglo-Indians as an ethnic group) use their roles in the band to represent ethnicity, Shahab (aka DJ Paso Bionic) and Earl assume a different involvement. As Earl explains to me later, his stage name, Atarungi, refers to a more spiritual perception of self, one not bounded by geography or ethnicity, but that of a 'shadow', of 'constantly spending time alone, even in the presence of others'. It's getting late and Adam and Earl have places to be. I give them a lift to the station. Hip hop has always provided 'a window', Adam tells me smiling, as we shake hands, 'but not enough people have looked through it yet'.